Pinky the dolphin in the sea. Anirut Krisanakul/Shutterstock. Pink dolphins are the sort of thing you might find in a fantasy novel, but one seems to have slipped out of the pages and jumped right into Earth&apos;s rivers. Introducing Pinky, the perfectly pink dolphin that has been seen happily frolicking in the waterways of Louisiana, America. She was first spotted in 2007 by Captain Erik Rue, who was sailing down the Calcasieu River. Since then, he has caught plenty of footage of the stunning dolphin, including this video in 2011. The magical pink color is probably the result of Pinky&apos;s inability to produce the skin pigment melanin, which gives dolphins their gray color. This disorder, which can affect all mammals, is of course known as albinism. The disorder is usually recessive, which means Pinky&apos;s parents could have had normal dolphin colourings, despite each carrying genes for the disorder. But wouldn&apos;t being an albino make her white, not pink? "The pink color is just blood at the skin&apos;s surface, like when humans flush or blush," Naomi Rose, from the Animal Welfare Institute, told the Dodo. "Same phenomenon. &apos;Regular&apos; bottlenose dolphins do this all the time too, but you can&apos;t tell, because their normal skin pigment is gray." 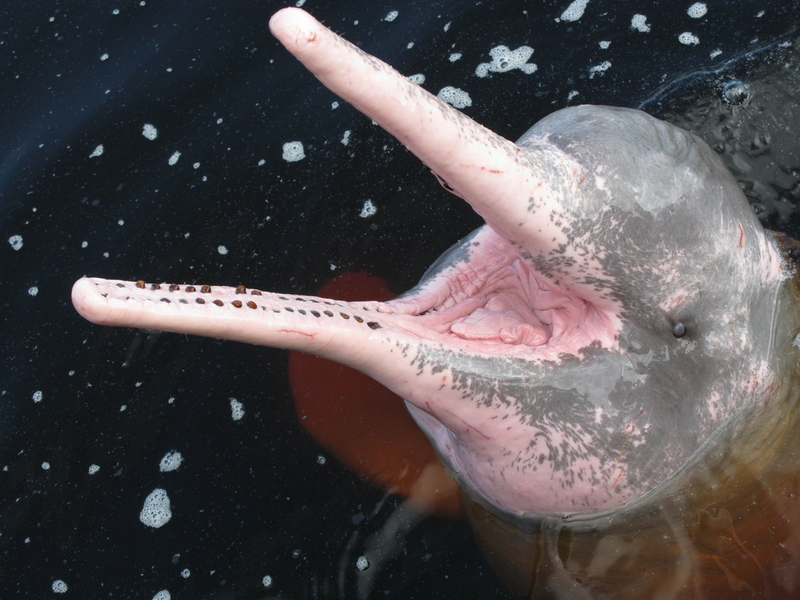 Another theory is that Pinky&apos;s pink hue is because she is an Amazon river dolphin (see below), which are naturally pink. However, not everyone agrees. "I know they have the Amazon river dolphins but those are kinda ugly and splotchy," Rue told Newsweek. "This one is just smooth pink, from tip to tail. It&apos;s very pretty. People love seeing it. It&apos;s an anomaly we are fortunate enough to have here." Regardless of how Pinky got her hue, there may be some little dolphins on their way to Louisiana waters. There has been speculation that Pinky has been seen mating. This doesn&apos;t necessarily mean that she&apos;s pregnant, and the chances of her having pink babies are even slimmer (her mate would need to carry albino gene). But that doesn&apos;t stop anyone from hoping! Pink Amazon river dolphin. Guentermanaus/Shutterstock.